There are no signs pointing toward an imminent recession in the region, but Phoenix, like many U.S. cities, will have to grapple with other looming issues, such as a shortage of workforce housing, during 2019, according to one local economist. 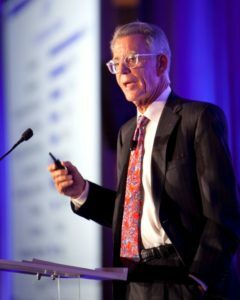 In Arizona, more than 88 percent of the job growth in the latest expansion has happened in greater Phoenix, economist Elliott Pollack said at the Greater Phoenix Chamber of Commerce’s Economic Outlook event Tuesday at the Sheraton Grand in downtown Phoenix. Despite population growth in the state being much slower than in previous economic cycles, Arizona’s “capture rate” of people moving significant distances continues to increase. Pollack said the state is likely to reach a point where 6 percent of people relocating outside of their home counties come to Arizona.